Sometimes I defrost some chicken and I don’t know what to do with it. Other times, quesadilla fajitas happen. Quesadillas. Love them. 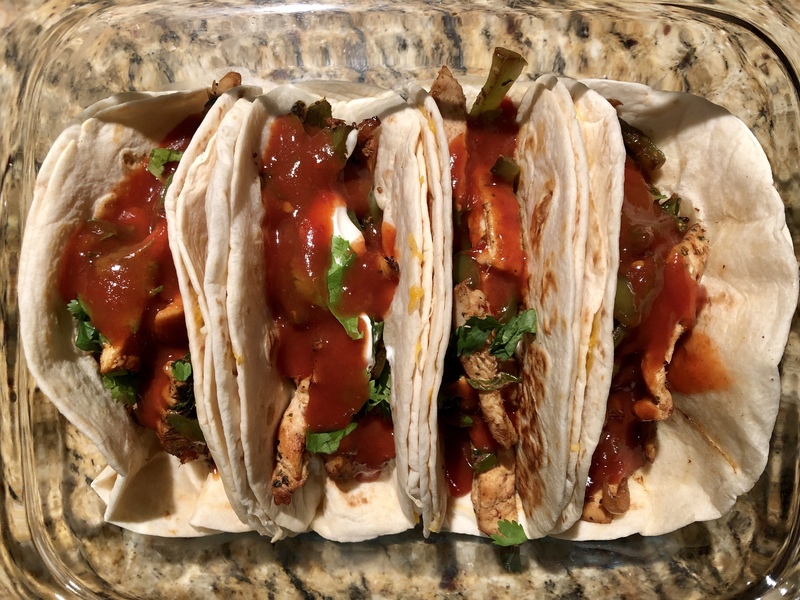 Fajitas. Love them too. Two birds in one stone type of cooking. Love that too. So what did I do? I made a cheesy quesadilla and used it as a base for fajitas. Your welcome. You won’t believe how delicious it is till you take a bite. Again, as is the case with most of my recipes, it’s so simple, but you take a bite and your brain is wondering, how? You can’t really tell what makes the other better. Is it the crispy quesadilla that’s doing the heavy lifting, or is the charred chicken and vegetables smothered in earthy spices that shine through? Here’s the recipe, so you can decide for yourself. Start off by marinating the chicken fillets in the taco seasoning, salt, crushed garlic, onion powder, dried coriander and chilli flakes. Heat 1-2 Tblspn oil in a pan and cook the chicken 3-4 minutes on both sides, then remove onto a chopping board. Using the same pan saute the onions and bell peppers for a couple minutes, then cover and cook on a medium low flame for a couple more minutes. Slice the chicken fillets into thin strips and spread them over the vegetables. Sprinkle over the green onions, cover and cook on a medium low flame for 5 minutes. While the chicken and vegetables are cooking heat a non stick pan or a skillet and make the quesadillas. Lightly butter one side of the tortillas, or spray with PAM. Place one tortilla butter side down and spread over some shredded cheese. I used 1/4 cup per quesadilla but add more if you like. Place another tortilla butter side up and flip over after 2 mimutes. You don’t want them to be very crispy, just a light golden brown so they can be folded or rolled. Once you’re done with all the quesadillas divide the chicken mixture between them. Dollop some sour cream and salsa on each quesadilla fajita and enjoy! You can make these beforehand and keep them in the oven to stay warm for a couple hours.